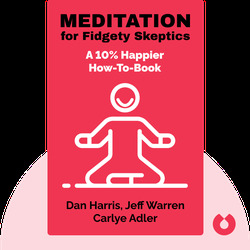 Meditation for Fidgety Skeptics (2017) is a down-to-earth beginner’s guide to meditation – especially for those skeptics among us who think that meditation is a lot of new age hooey. 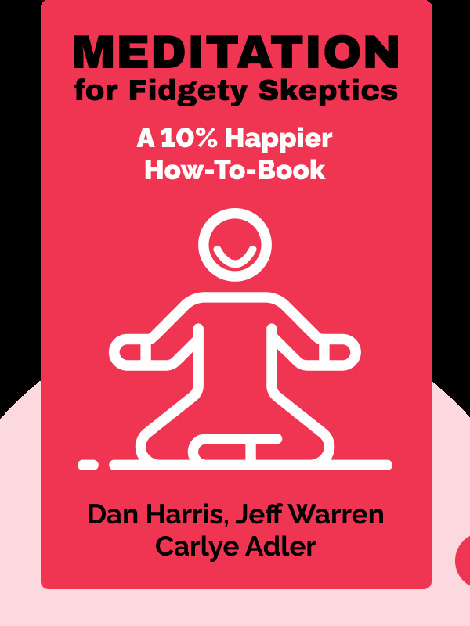 Dan Harris presents readers with a firsthand account of how even people with restless minds and no time to spare can start experiencing the scientifically proven benefits of meditation. Dan Harris, a frequent contributor to Nightline and 20/20, is a longtime correspondent for ABC News, as well as the co-host for Good Morning America’s weekend edition. Based in New York City, he’s traveled the world to report from areas as diverse as Cambodia, Afghanistan and Haiti. He’s also the creator of the 10% Happier podcast and app, both of which strive to bring the benefits of meditation to busy urban professionals. Jeff Warren is a writer and teacher who’s been called the “Meditation MacGyver.” He’s also the founder of Toronto’s Consciousness Explorers Club, a vibrant meeting place for adventurous meditators. Carlye Adler is a journalist whose work has appeared in BusinessWeek, Forbes, Newsweek and Wired, just to mention a few. She’s also the co-author of numerous books, including the New York Times bestseller, Rebooting Work: Transform How You Work in the Age of Entrepreneurship.